EFFINGHAM, Ill. (AP) _ It’s only been six months since Jake Buhnerkempe opened J&R Collision on the south side of Effingham with his father, Roger, and already Jake is looking to grow the business as demand increases. It’s no wonder. 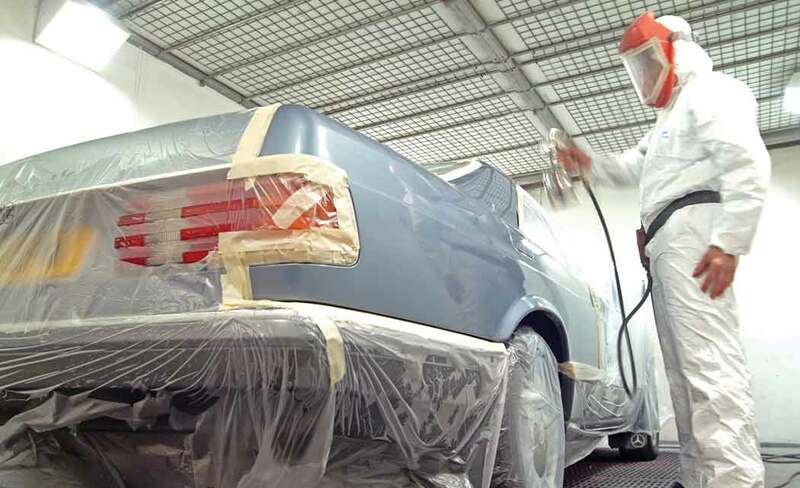 Roger’s Body Shop had been a staple in Effingham since 1980, changing locations a couple of times before finally settling in Effingham Industrial Park. Roger sold the business in 2002 and started a business that was a departure from the auto body business _ excavating. Son Jake had grown up in his father’s auto body shop. Although he liked working in the shop, he decided to pursue another passion _ firefighting. After volunteering for a couple of local fire departments, Jake decided to get experience working for a big city. He tested for the St. Louis Fire Department and was soon hired. The job, however, meant a unique work schedule. Jake worked 24-hour shifts, logging only 10 calendar days a month. So, he decided to pursue his other passion with the days he had off. In 2010, he opened Jake’s Collision repair. “At first, it was going to be a hobby for something to do. Days I wasn’t working at the fire department I was going to do work for friends and family. It just kept growing and growing,” he said. After working for the St. Louis Fire Department for six years and the arrival of his first child, Jake and wife Sarah realized they wanted to move back to their hometown to raise their family in the close-knit community they grew up in. So, Jake joined his father and started J&R Collision. The move, however, meant Jake would have to hang up his fireman’s helmet after six years with the St. Louis Fire Department. But he wouldn’t have to give up firefighting altogether. “I got that bug in me, so I couldn’t hang it up for good,” he said. Jake volunteers for Watson Fire Protection District and hopes his experience on the St. Louis department can be of some use. Besides running a business and firefighting part time, Jake also still manages his St. Louis shop, spending one or two days there a week. “They’re definitely different in the way you market each and the way each is ran, but the basics are still very much the same,” he said. Jake admits he’s not one to sit idle. A trait he says he inherited from his father. “Dad had the shop (Roger’s Body Shop) for 22 years, but we always joked he put about 40 years of work into 20. I was fortunate to get that work ethic from him,” he said. As Jake concentrates on growing the business, he said the hardest part is not having a more hands-on role. “I still very much would rather be out in the paint booth painting or banging on the fender of a car,” he said. Even though Jake would rather be working on a vehicle, he knows his time is needed working on the businesses and less working in them. “I still like to get out there any chance I can,” he added. Jake believes the number of people who were served by his father’s shop and are now coming to the new shop is a testament to the close-knit community in which he lives. Jake and Roger want to continue to foster that connectivity by giving back to the community through a couple of projects they have planned. One will be contributions to charities or hosting charity events at the shop. Another the business will launch in the coming weeks is a local version of the makeover shows that have become popular. The shop will make over a vehicle for a deserving individual free of charge.